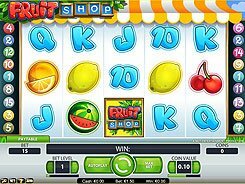 Fruit Shop is a simple 5-reel slot with a strong classic feel to it, while the quality of the graphics gives it a modern touch. The slot is played over 15 fixed lines, and a bet size adjustable from $0.15 to $150 per spin makes it a good option for low bettors and high rollers alike. The reels are populated by traditional fruit icons and poker cards from 10 to Ace. 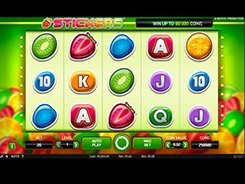 The slot’s logo serves as a wild that substitutes for other non-feature symbols and doubles payouts when substituting. The only downside to the wild is that it does not form its own winning combos. 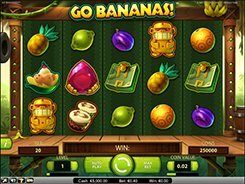 The free spins feature is triggered very often, and that’s what makes the slot very appealing. 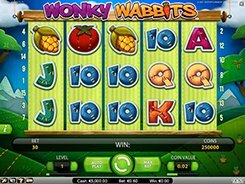 To unlock 1 to 5 free spins, you need to hit three or more matching regular symbols across a payline (in case of cherries, these two will suffice), thus actually every winning combo will trigger one or more free spins. 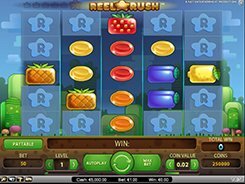 During the feature any winning combo adds extra free spins. 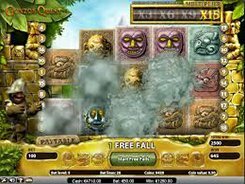 The first, second and third largest prizes in the slot are $20,000, $10,000 and $7500 respectively.